Much was made of Sarah Palin’s recent trip to the Big Apple, where she got to meet several foreign heads of state in town for a U.N. summit. This was arranged in order to assure the public that Ms. Palin was studying up on foreign policy issues, beyond what she could see through her binoculars on a clear day. Or as the pundits put it, “burnishing her foreign policy credentials.” Huh? What foreign policy credentials? Republican talking points went on to explain how this was a terrific chance to show the American people that Sarah could sit down with foreign leaders and be taken seriously. Except we weren’t shown that at all because after their photo opps, the press were shoo’d outta there, pronto. One got the feeling that had any reporter dallied, shotguns would have been produced. I guess the PTB were afraid that the media might report a misstep or bungle. Still sore about the Bush Doctrine Moment, are they? 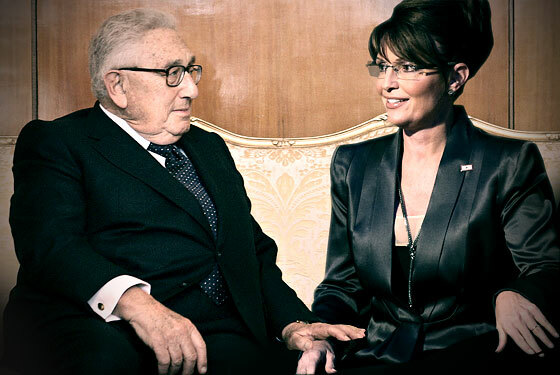 Further, pundits crowed that Sarah cozied up to Henry Kissinger, who briefed her about the crisis in Georgia. (No, honey, not that Georgia, the one next to Russia.) I feel so much better now, don’t you? A 30 minute cram course, and she’s good to go! A little face time with Karzai, and she’s an expert on Afghanistan. Brunch with Colombian President Uribe, and she’s ready to make trade agreements. . . And all I got when I went to New York was a stupid t-shirt. I’m really glad that all one needs in order to be considered qualified as a foreign policy adviser is to be able to take a good meeting. It makes me think that all those years mastering the board game “Diplomacy”during high school should go on my resume. And what else am I qualified to do, now that the “expert bar” has been set so low? Let’s see… I once had my photo snapped with Reggie Jackson, and he signed my Oakland As program, so I guess I’m an authority on baseball. I’ve kissed a Hollywood movie star, so I’m ready for my close-up, Mr. Speilberg! I’ve taken my mechanic to dinner, so when’s he going to let me fix my own car? Hey, I know! I have a friend of a friend who is a cardiologist. Maybe she can hook us up, and before you know it, I can write a book on heart disease! And we all have Sarah Palin to thank for making expertise so much more…well, accessible. Ah, let’s hear it for the American Dream! ~ by Jolene Rae Harrington on September 24, 2008. Tags: foreign policy, Henry Kissinger, Jolene Rae Harrington, New York, Reggie Jackson, Sarah Palin, U.N.